Officials signed unusual agreement to remove four hydropower dams on the Klamath River. Last week, U.S. 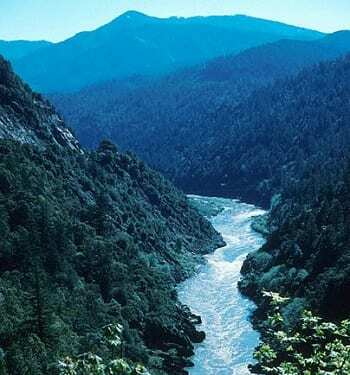 Interior Secretary Sally Jewell signed agreements with the governors of California (Governor Jerry Brown) and Oregon (Governor Kate Brown), which plans to remove four hydroelectric dams from the Klamath River by 2020. The river spans 263 miles and is located in both states. Jewell said that if the plan is successful it will result in one of the largest river restoration projects in the history of America. Endangered salmon are expected to be able to return to their historic spawning grounds. Tearing down the dams will enable endangered salmon – which have been blocked for almost a century from hundreds of miles of the river – to return to their original spawning grounds. The fish are expected to return en masses once the dams are gone. The dams have been blamed for degrading the quality of the water and for spreading algae blooms and fish diseases. According to a news report from the Associated Press, in 2001, water deliveries to ranchers and farmers were drastically curtailed and adult salmon suffered a massive die-off one year later. This resulted in a sharp reduction in salmon harvests for some Native American tribes, such as the Yurok Tribe. Salmon is sacred to this tribe and is used for subsistence and ceremony. The agreements include promises that involve more than tearing down the hydroelectric dams. The agreements made include promises to maintain working on a settlement process that has been ongoing for the past six years, but went dormant when Congress didn’t approve it in 2015. Aside from removing the dams, an initial settlement would have provided more water for ranchers and farmers and restored tribal lands. Many studies have revealed that making upgrades to the dams would not only likely notably decrease their energy generation output, but will also likely cost millions of dollars more than removing them and replacing the energy with other sources of power. If approved, the $450 million project would receive funding from PacificCorp customers in California and Oregon and from a water bond approved back in 2014 by California voters. The PacificCorp utility is in favor of removing the hydroelectric dams because it provides the company with liability protections and caps the cost to its customers.